Metastatic melanoma is the deadliest form of skin cancer. The five-year survival rate for patients with advanced stage disease is 18 percent, per the American Academy of Dermatology (AAD). 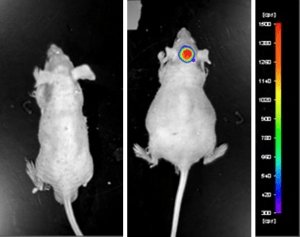 Preclinical xenograft animal models can provide insight into in vivo treatment responses in humans as well as help finding new therapeutics for metastatic melanoma. The B16 cell line was isolated from the skin cells of a mouse (Mus musculus) with melanoma. B16 is an excellent host for skin cancer studies as well as for experimental cellular and molecular biology. Targeting the Src/STAT3 pathway is viewed as a novel approach for melanoma management. A 2014 study by Fu et al. 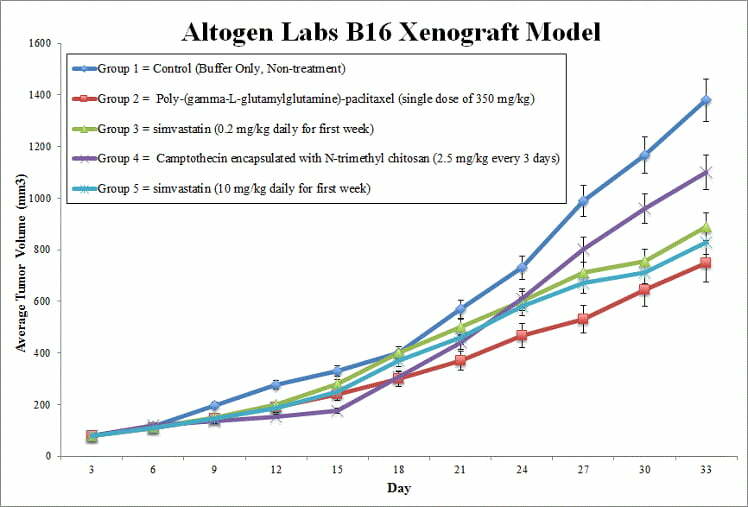 published in Experimental Dermatology investigated the involvement of STAT3 signaling in the anti-melanoma action of atractylenolide II (AT-II), using the B16 xenograft model. According to the article, AT-II significantly inhibits tumor growth in the B16 xenograft mouse model and blocks the activation/phosphorylation of STAT3 and Src in the xenografts. An Annals of Oncology article by Sanmamed et al. (2016) reviewed melanoma models, including the B16 model, that are appropriate for studying immunotherapy and checkpoint blockers in murine xenografts. They highlighted the importance of replicating the human tumor microenvironment, especially in regards to a functioning human immune system. Similarly, Kuzu et al. (2015) published a Cancer Growth Metastasis study reviewing patient-derived tumor xenografts (PDTXs), genetically engineered mouse models (GEMMs), and syngeneic models in melanoma research. They reviewed B16 cells in context of syngeneic models; B16 is commonly used because they form tumors after chemical induction and have an array of subclones varying in invasion, proliferation and metastasis. Lastly, Yoshiura et al. (2009) used the B16 model to study the anticancer effects of vaccination with Tpit/E cells, whole endothelial cells that are predicted to function as type of immunotherapy. Results demonstrated that vaccination of B16 xenografts with Tpit/E cells resulted in inhibition of subcutaneous tumor growth as well as appearance of lung metastases. The B16 cell line (mouse melanoma) is used to create the CDX (Cell Line Derived Xenograft) B16 xenograft mouse model. The B16 melanoma model is widely used to screen anti-proliferation therapeutics (e.g. simvastin, paclitaxel). Cells used for injection are maintained at exponential phase growth prior to inoculation. Upon start of the study, the B16 cells are collected by trypsinization and the cell count viability is determined using a trypan blue exclusion assay (required: 98% cell viability). The cell suspension is adjusted to the required density for injection. All mice (severe combined immunodeficient SCID mice, 8-10 w.o.) receive a single subcutaneous injection in the hind leg. Each 100 µL injection contains one million cells of the B16 Matrigel cell suspension. Injection sites are palpated three times a week until it is determined tumors are established. Tumors are measured with digital calipers until they reach an ideal average size of 50-150 mm3. Animal randomization into the treatment cohorts and administration of the compound of interest is performed following the treatment schedule. Daily tumor measurements and mouse weights (3 times weekly) are recorded. Animals are euthanized when tumor size reaches the predetermined size limit or 2,000 cu millimeters. Necropsy is performed as defined for termination of experiment. All tumors are excised, weighed and then documented via digital imaging. Standard gross necropsies are performed and tissues collected for downstream analysis. Tumors and tissues are stabilized in RNAlater, snap frozen in LN2, prepared for histology or nucleic acid isolated for expression analysis. Animals were housed in a pathogen-free animal facility in accordance with the Guide for Care and Use of Laboratory Animals and the regulations of the Institutional Animal Care and Use Committee (IACUC).